And this is the effect of phonesthemes which lacks the precision of a morpheme, but has an ‘associative’ force sparked by sound. Awareness of the phonesthemes this week sparked conversations about the ’feel’ and connotations of words. We too discussed this week <sn> in an initial position. A mad race calling out many words – many having a nasaly, whining, unpleasantness, a nose curling condescension: snitch, sneer, snarl, snort, sniff, snide, snivel, snore, snicker, snoop,snob. And why this phonesthemic leap? We had begun the year learning two poems revolving around dreams: ‘Dreams’ by Langston Hughes and ‘Aedh Wishes for the Cloths of Heaven’ by WB Yeats. 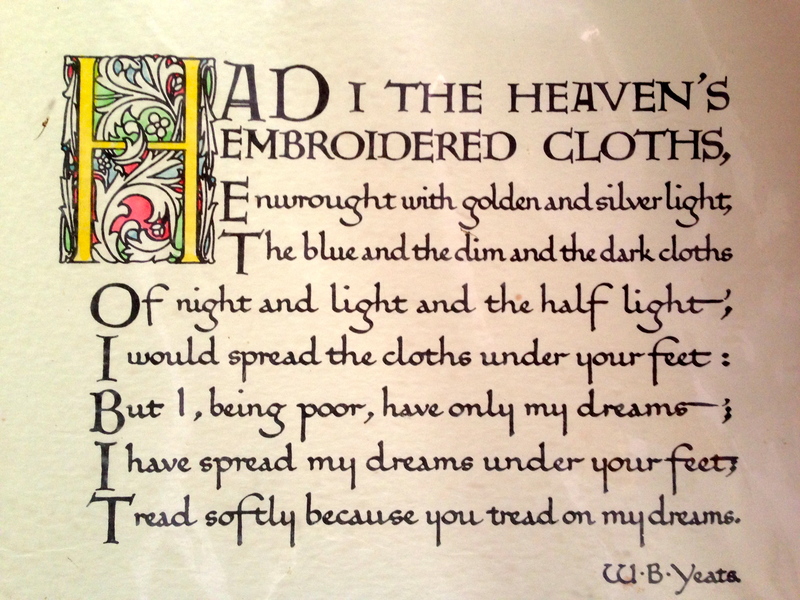 It was the second line of Yeats’s beautiful poem, ‘Had I the Heaven’s embroidered cloths, Enwrought with golden and silver light’ that triggered this particular word inquiry. On student asked about the meaning ‘enwrought’ (archaic, poetic as indicated by OED) unaware that he was instigating a venture down a slippery (and the initial consonant cluster ‘sl’ is also well worth a phonesthetic investigation: slide, slink, slop,slope) side-path of phonesthemes. We discovered two elements in the word ‘enwrought’: a prefix <en-> and a free base element <wrought> from mid 13th c. past participle of the O.E. root for work. What other words began with <wr>? What underlying sense did these words suggest? We investigated the origins of all these words and discovered Germanic /O.E. roots. All words conveyed a sense of twistedness, of distortion. Read Online Etyomology Dictionary here about<wr->. ‘wroath’ Shakespearean meaning misfortune perhaps from ruth. The most intriguing award goes to the ‘wrybill’, a wading bird native to New Zealand, whose sideways curving bill ‘wrests’ food from under rocks. The New Zealand Wry-Bill: a vulnerable species of wading birds endemic to New Zealand. This fascinating entry goes on to raise issues of ‘etymological fitness’ and attempts to purify the language: ‘The substitution of in- for en- has in part been due to notions of etymological fitness, the Romanic en- having been regarded as a corrupt and improper form of the Latin in-, while the English formations in en- were either referred to Latin analogies or treated as compounds of the native preposition’. I read with interest that ‘the now prevailing tendency is to use en- (em- ) in English formations’. Perhaps that is why Yeats chose ‘enwrought’ rather than ‘inwrought’ , yet in my Mac Oxford Dictionary it is only ‘inwrought’ that has made it into the dictionary: with the following denotation: ‘adjective literary, (of a fabric or garment) intricately embroidered with a pattern or decoration’. † enlabyrinth:v. Obs. to entangle as in a labyrinth. 1652 E.Benlowes Theophila i. liii. 8 ‘My Soul, enlabyrinth’d in Grief’. † ennet v. Obs. to entangle.1598 J. Florio Worlde of Wordes,To ensnare or take in a net or ginne,to entramell,to ennet. † enjourney v. Obs. (refl.) to start on a journey. 1596 R. Linche Dom Diego in Diella sig. F6v, The next day, They would eniourney them. englamour v. to surround with 1864 Dicey in Daily Tel. 15 July, The memory of a great past still englamours them [the Danes]. † enstomach v. Obs. to encourage.1545 T. Raynalde Womans Bk. 59 The midwife..enstomakyng her to pacience. † encouch:v. Obs. to lay upon a couch, fig.1596 Raigne of Edward III sig. B4v, Encouch the word..with such sweete laments. † engrape v. Obs. to cover with grapes.1523 J. Skelton Goodly Garlande of Laurell (Dyce) 656 Vinis engrapid. † endart v. Obs.1599 Shakespeare Romeo & Juliet i. iii. 100 ‘More deepe will I endart mine eye’. enfuddle v.1822 J. Wilson in Blackwood’s Mag. 12 113 Punch our powers insidiously enfuddles. engarble v. to mutilate.1609 Bp. W. Barlow Answer Catholike English-man 73 The engarbled Anatomie of a damned wretch. engladden v.1874 E. B. PUSEY Lenten Serm. 246 Thee..Who didst..engladden..me. enlanguish v. Obs. to render languid.1603 J. FLORIO tr. Montaigne Ess. III. xiii. 647 It is pittie a man should be so..enlanguished.1654 A. COKAYNE tr. G. F. Loredano Dianea IV. 329 Her eyes, enlanguished by griefe. enwisen v. to make wise.1860 E. B. PUSEY Minor Prophets 427 Enwisening, rejoicing, enlightening the soul. Perhaps now you too like me are ennetted in this <en-> list. Enwisened and engladdedned by these discoveries you will encouch and engrape yourself reaching perchance a state of enlanguishment! And to return finally to where we began with Yeats. Listen to the students who below recite this poem and enticed by the ‘taste’ and the sound of the words have grappled it to their hearts. We discussed the last lines of the poem and have taken the last lines to heart reminding ourselves of the need to ‘tread softly’ with one another, all of us vulnerable, all of us learning to be open, to take risks in our thinking and to collaborate and challenge one another in a respectful way as we together build our year long learning community. My own copy of the poem- a gift from my daughter Kezia. Printed by Cuala Press, established by Elizabeth ‘Lolly’ Yeats, sister of William, Jack and Lilly. The print on the left of the poem was created by Cuala Press, formerly Dun Emer, established to support the Irish arts and craft movement.This press set up by the Yeats sisters was the only press run solely by women. They published 48 titles of WB Yeats, as well as works by Ezra Pound, Jack Yeats, Robin Flower, Elizabeth Bowen,Patrick Kavanagh, Louis MacNeice, John Masefield, Frank O’Connor, Synge and Rabindranath Tagore and others. Read more about Cuala Press, operational until 1946. Read about Jack Yeats, hero of Colm Toibin who felt Jack captured the instablity of the Irish light. “He saw its swirling, cloud-laden movements as pure gift.’ Both brothers intrigued by the light. Read more about the vulnerable Wrybill. In the discussion of the ‘in-‘ / ‘en’ alternations (which is nicely and clearly summarized), there is a clue in your citation of the archaic ‘enlabyrinth’ to a further facet of the prefix. The base ‘labyrinth’ is clearly Greek (the medial ‘y’, and the direct root in Greek legend signal that fact), the form is – and only is, when the derivation is Greek – ‘en-‘, not ‘in-‘. This is because the Greek preposition for “in” that is the etymon of the prefix of ‘enlabyrinth’ was (and still is in Greek) ‘ἐν’. If you compare and contrast the Latinate ‘insect’ and the Greek ‘entomology’ you’ll find this classical ‘in’ / ‘en’ relationship is clear. Another obvious example of the Greek ‘en-‘ that springs to mind is ‘encyclopædia’. Your young word sleuths will certainly identify many more. So interesting Old Grouch ! Of course labyrinth is Greek and we didn’t even consider it! Great clues/clew for us to further ‘enlighten’ our understanding of this prefix. Much more to investigate here, such as: when is the other form ( its allomorph?) em- used? What are the initial letters used in the base that lead to em-? What initial letters lead to en- being used? Then the sort between the circumstances for’ in’- and ‘en-‘… hope I don’t become ‘entangled’, ‘enmeshed’ and ’embarrassed’! !